Posted on June 17, 2015 at 1:52 pm. In June 2015 the East Village Community Coalition released Preserving Local, Independent Retail: Recommendations for Formula Retail Zoning in the East Village, an analysis of the the growing presence of chain stores in the lower Manhattan neighborhood. These stores are changing the landscape of the neighborhood by altering the shopping choices from independent to mass-market retailers. Three possible methods of formula retail zoning are proposed within the report. These options — aimed at informing decisions by East Village policy makers — have been crafted using case studies, legal suggestions and pre-existing zoning frameworks from other parts of the country. Join us to learn more about the proposals and ask questions about efforts to block the proliferation of chain stores in New York State and beyond. The Preserving Local, Independent Retail Roundtable is presented as part of our Get Local! campaign launched in 2006 to promote a diverse retail mix of independent stores that reflect the neighborhood’s character and serve its population. Posted on February 24, 2015 at 4:47 pm. Join neighbors, local business people, and a panel of experts to save and protect the small businesses that are the lifeblood of our community. The City Council on January 22, introduced a new resolution calling upon Albany to pass legislation establishing a property tax credit for commercial landlords who voluntarily limit rent increases upon renewal. Only landlords who “volunteer” to participate will be given tax breaks as incentives to not rent gouge tenants. The opposite option, the Small Business Jobs Survival Act, (S.B.J.S.A.). regulates the lease renewal process by giving rights to business owners equal to landlords to negotiate fair lease terms, and the right to 10 year leases. If both parties can not mutually agree on lease terms, the bill calls for Arbitration. Which of these is the best solution? Or is there a better solution? Landlords now have all the rights, rights to determine the destiny of owners, their workers, and the destiny of the character and culture of an entire community. Because the gateway to the American Dream has been locked, the key freely handed to big Real Estate, many feel it is time to throw a ‘life line’ and ‘empower’ our struggling small businesses now drowning in a sea of greed. Posted on October 22, 2014 at 8:18 pm. Do you live in the East Village? Or love to visit? Don’t get here often enough? Let us know what you think! Take our short survey by November 22nd to help us determine where and how people are spending in the community. Take part is sharing your vision for the East Village. Visit www.eastvillagesurvey.com today! The survey is part of the of the organization’s retail diversity campaign, which advocates for increased diversity of available retail and local services for residents within the East Village. Learn more at our website: www.evccnyc.org. The East Village Consumer Survey is made possible with the support of AvenueNYC, a program of the NYC Department of Small Business Services. Posted on November 15, 2013 at 4:30 pm. 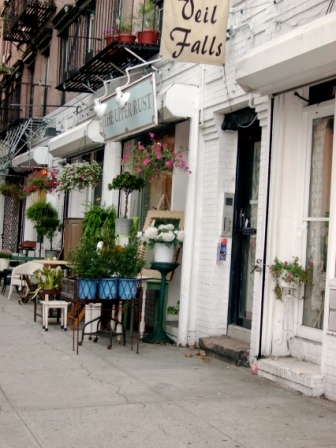 Our neighborhood boasts resident-serving retail outlets and unique offerings from creative merchants. The East Village is NOT a strip mall – thankfully the monotonous chain stores found in town after town are in short supply here. In an attempt to keep our neighborhood independent and unique, we publish our free Get Local! Guide to East Village Shops each year. The updated 7th Edition is available now! The newly available 7th Edition lists more than 450 local merchants and is available in shops and cafes in the neighborhood. You can download the online version or pick up your free copy today! Posted on September 7, 2008 at 11:28 am. Earlier this summer, on June 12, the Graduate Cener for Planning and the Environment at Pratt Institute had some good news for the Lower East Side. In a presentation at St. Mark’s Church for the Neighborhood Presentation Center, the Pratt Group discussed the first draft of a study that provides a comprehensive plan to encourage small local businesses on the Lower East Side and discourage large chains. Village to seek designation as a “special district.” This would allow the area to enforce Formula Retail Zoning — which is an imposing name for a system that sets some limits on the types of businesses in an area in order to preserve the local retail environment. The study, which was commissioned by the EVCC, is one of the most comprehensive investigations into Formula Retail Zoning in New York City’s history. The EVCC’s goal is to present the study, when it is completed later this year, to locally elected politicians, city planning commissioners, and the Mayors office and help them understand why the “special district” designation is so important for the future of the neighborhood. As part of that process, videographer Nicholas Whitaker (who did such a great job with his video chronicle of the first Lower East Side Kids’ Art Bike Parade in 2007) has been asked by the EVCC to make a film that demonstrates the way local merchants improve street life. For instance, he will contrast vibrant streets full of local merchants — like East 9th Street — with “dead zones” where chains have invaded, like the stretch of Houston where Whole Foods has generated a wall of glass that discourages community-style street life. The film, which will be shot this fall, will be ready for presentation to authorities by the end of this year. As the EVCC gets closer to making an official presentation of a plan, community support will be needed. If you have thoughts about the value of Formula Retail Zoning, please log-in or register in the left hand column of this page, and post your thoughts below.